Habitat destruction is the #1 issue that impacts wildlife and biodiversity today. The term “habitat destruction” can refer to the complete destruction of a habitat or, more commonly, habitat fragmentation, where a large, continuous area of a habitat is divided into two or more fragments. The primary culprit behind habitat destruction is a change in land use. The most common forms include clearing land for agricultural use, extractive industries like logging or mining, and expanding urban or residential development. There are five common strategies that corporations use to combat habitat destruction, four of which we will cover here: avoidance; minimization; rehabilitation and restoration; and biodiversity offsets and voluntary compensatory actions. The fifth major strategy—supply chain management—we’ll cover later in this 5-part series. The first—and best—strategy that companies can adopt to address habitat destruction and biodiversity loss is a simple one: avoid any development or operations in areas identified as important habitat for species that are classified as endangered, threatened or vulnerable to extinction; or areas that have been identified as critical for the conservation of biodiversity because of existing species richness. On land that is not categorized as an avoidance zone, corporations shift their attention towards minimization strategies that reduce the duration, intensity and extent of their impacts for biodiversity and wildlife. Minimization strategies can take a wide variety of forms, including site selection strategies, operational policies and procedures, wildlife corridors and green roofs. For example, to transport material and facilities needed for a project located near the fragile Tibetan plateau of the Sanjiangyuan National Nature Reserve, workers from the State Grid Corporation of China used an “Electricity Caravan” of horses rather than build roads or bridges in this ecologically sensitive area. 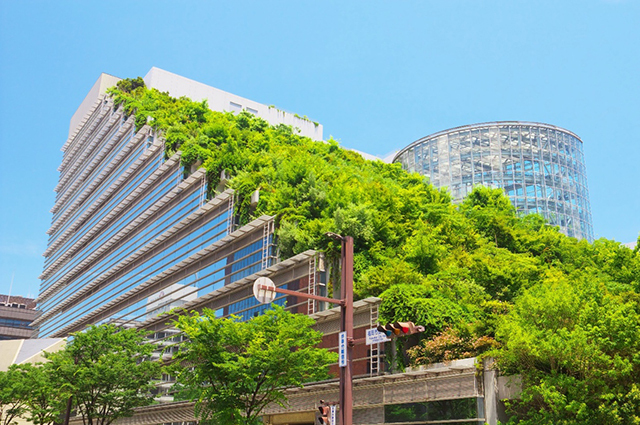 In another example, companies such as Facebook, Macy’s, and Ford have installed green roofs, which not only save money, but also provide habitat for a variety of insects and birds. In situa­tions where avoidance and minimization are not practical or feasible, companies may turn to a third strategy: rehabilitation and restoration. With this strategy, a company attempts to rehabilitate degraded ecosystems or restore cleared ecosys­tems in areas that have previously been cleared, developed or neglected. In another example from China, The China National Petroleum Corporation (CNPC) pursued an ecological restoration effort as part of its Western Pipeline project. As soon as the new pipes were laid down and buried, CNPC planted vegetation to restore the original landscape and followed up with annual monitoring and remediation measures. If avoidance, minimization and restoration strategies aren’t viable options, then companies may pursue a fourth strategy: biodiversity offsets and voluntary compensatory actions. A well-known example of a voluntary compensatory action is Walmart’s Acres for America Program, which has a goal to conserve one acre of wildlife habitat for every acre of land developed by Walmart stores. So where does the Half-Earth Project fit in? The Half-Earth Project is creating a global map of fine resolution species distribution that will provide companies, such as Walmart, a unique tool for decision-making in support of biodiversity. The Half-Earth Map can be used to see where various species groups have rich or rare populations, so that companies can avoid development in these special places. The Half-Earth Map can also be used to identify the places that offer the best opportunity to offset biodiversity impacts through conservation management of land that is particularly rich in biodiversity. This tool can guide and ensure that conservation investments are happening in the optimal places for biodiversity while also showcasing the biodiversity value that these kinds of investments can bring to these places. That wraps up our whirlwind tour of how corporations can address the biodiversity threat of habitat destruction, and how the Half-Earth Project can help corporations make sound decisions that are good for business and good for biodiversity. In next week’s post, we’ll turn our attention to the #2 threat to biodiversity: invasive species. See you then!